Palestinian cuisine consists of foods from or commonly eaten by Palestinians—which includes those living in Palestine, Jordan, refugee camps in nearby countries as well as by the Palestinian diaspora. The cuisine is a diffusion of the cultures of civilizations that settled in the region of Palestine, particularly during and after the Islamic era beginning with the Arab Ummayad conquest, then the eventual Persian-influenced Abbasids and ending with the strong influences of Turkish cuisine, resulting from the coming of the Ottoman Turks. It is similar to other Levantine cuisines, including Lebanese, Syrian and Jordanian. The area is also home to many desserts, ranging from those made regularly and those that are commonly reserved for the holidays. 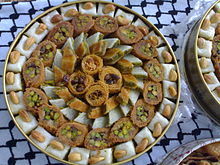 Most Palestinian sweets are pastries filled with either sweetened cheeses, dates or various nuts such as almonds, walnuts or pistachios. Beverages could also depend on holidays such as during Ramadan, where carob, tamarind and apricot juices are consumed at sunset. Coffee is consumed throughout the day and liquor is not very prevalent among the population, however, some alcoholic beverages such as arak or beer are consumed by Christians and less conservative Muslims. Village oven, taboun, in Palestine. Photo taken between 1898 and 1914 by American Colony, Jerusalem. From Palestine comes olives, dried figs, raisins, the carob fruit... from Jerusalem comes cheeses and the celebrated raisins of the species known as Ainuni and Duri, excellent apples... also pine nuts of the kind called 'Kuraish-bite', and their equal is not found elsewhere... from Sughar and Baysan come dates, the treacle called Dibs. The cuisine of the Ottoman Empire—which incorporated Palestine in 1516—was partially made up of what had become, by then a "rich" Arab cuisine. After the Crimean War, in 1855, many other communities including Bosnians, Greeks, French and Italians began settling in the area especially in urban centers such as Jerusalem, Jaffa and Bethlehem. These communities' cuisines contributed to the character of Palestinian cuisine, especially communities from the Balkans. 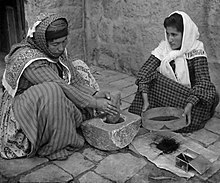 Until around the 1950s-60s, the main ingredients for rural Palestinian cuisine was olive oil, oregano and bread baked in a simple oven called a taboon. Author G. Robinson Lees, writing in 1905, observed that "The oven is not in the house, it has a building of its own, the joint property of several families whose duty is to keep it always hot." There are three regions of Palestinian food; The Galilee, which is the northern part of the State of Israel, the "West Bank" and "Gaza Strip" which are parts of land occupied by the Israelis during 1967 war from Jordan and Egypt accordingly. In the Galilee, bulgur and meat (beef or lamb) are primary ingredients that are often combined to form several variations of dishes ranging from a family-sized meal to a side dish. However, in the West Bank and the Gaza Strip, the populations have a cooking style of their own. In the West Bank, meals are particularly heavy and contrast from the foods of the northern Levant. Main dishes involve rice, flatbreads and roasted meats. The staple food of the inhabitants in the Gaza Strip is fish due to its location on the Mediterranean seacoast. Their cuisine is similar to that of the Levant's; however, other spices are used more frequently. These generally include chili peppers, dill seed, garlic, and chard to flavor many of Gaza's meals. Although the cuisine is diverse, generally Palestinians are not restricted to the foods of their specific region and there is constant culinary diffusion amongst them. Although, because of Gaza's isolation from other Palestinian and Levantine Arab areas, their cooking styles are less known in the region. The cuisine of the Galilee is very similar to Lebanese cuisine, due to the extensive communication between the two regions before and after the establishment of Israel. The Galilee specializes in a number of meals based on the combination of bulgur, spices and meat, known as kubbi by Arabs. Kubbi bi-siniyee is a combination of minced lamb or beef mixed with pepper, allspice and other spices wrapped in a bulgur crust, then baked. Kubbi bi-siniyee could serve as the main dish during a Palestinian lunch. Kubbi neyee is a variation of kubbi, that is served as raw meat mixed with bulgur and a variety of spices. It is mostly eaten as a side dish and pita or markook bread is used for scooping the meat. Since the dish is raw, whatever is not eaten is cooked the next day in either the baked version or as fried kibbee balls. The mezzeh consists of a wide variety of appetizers, usually including hummus (sometimes topped with meat), baba ghannouj, labaneh, tabbouleh, olives and pickled vegetables. Akkawi cheese, a semi-hard cheese common throughout the Middle East and among the Arab diaspora, originated in the city of Akka, from which the cheese receives its name. In addition to meals, the West Bank's many subregions have their own fruit-based jams. In the Hebron area, the primary crops are grapes. Families living in the area harvest the grapes in the spring and summer to produce a variety of products ranging from raisins, jams and a molasses known as dibs. The Bethlehem area, Beit Jala in particular, and the village of Jifna are known regionally for their apricots and apricot jam as is the Tulkarm area for its olives and olive oil. Quzi is a rich rice dish with chopped vegetables and roasted meat made in the Taboon served with it. The dish is seen as comparatively simpler in its cooking than other Palestinian dishes, because it is cooked with basic rice (with diced vegetables) and a meat served on top of it. The meal is served in a large sidr, similar to mansaf, decorated with chopped parsley and pine nuts or chopped almonds. Another variant of this is the Zarb which has bread dough instead of rice although this is due to the Jordanian influence in the region. 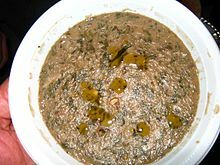 Mloukhiyeh is a stew made from Corchorus. The Corchorus is picked during harvest time, and is either frozen or dried. It is widely popular in the middle east, as it is commonly grown in dry climate areas. The stew is cooked with lemon juice and water, and served with cut lemons and rice. The meal can be served with either chicken or lamb however it can be served without either (unlike many other Palestinian meals). Musakhan is a widely popular Palestinian dish composed of roasted chicken, with fried onions, sumac, allspice, safron and pine nuts atop one or more taboons. The dish is usually eaten with the hands and served with cut lemon on the side. In April 2010, Palestinians were entered into the Guinness Book of World Records for largest Musakhan dish. Mahshi (pl. mahshi) dishes are composed of rice stuffed vegetables such as, eggplants, baby pumpkins, potatoes, carrots and marrows as well as a variety of leaf vegetables, primarily grape leaves, cabbage leaves and less often chard. Mahshi requires delicacy and time—the main reason it is prepared before the day it is cooked and served. Many female family members participate in the rolling and stuffing of the vegetables, relaxing the amount of individual effort required, with great attention to detail. Waraq Dawali (stuffed grape leaves), is a mahshi meal reserved for large gatherings. The grape leaves are normally wrapped around minced meat, white rice and diced tomatoes, however meat is not always used. Dawali is an excellent representation of the attention to detail commonly found in Palestinian and Levant cuisine, with each piece being tightly wrapped to the size of cigarette morsels (some families differ in their structure).It is then cooked and served as dozens of rolls on a large plate usually accompanied by boiled potato slices, carrots and lamb pieces. Kousa mahshi are zucchinis stuffed with the same ingredients as waraq al-'ainib and usually served alongside it heavy meals. If made with a large number of zucchinis as well as dawali it is known as waraq al-'ainib wa kousa. Bread dips and side dishes such as, hummus, baba ghanoush, mutabbel and labaneh are frequented during breakfast and dinner. Jibneh Arabieh or jibneh baida is a white table cheese served with any of the above dishes. Ackawi cheese is a common variation of jibneh baida. Ackawi cheese has a smoother texture and a mild salty taste. 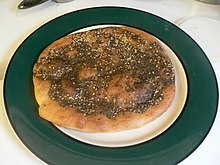 Labaneh is a pasty yogurt-like cream cheese either served on a plate with olive oil and za'atar—which is generally called labaneh wa za'atar—or in a khubz sandwich. 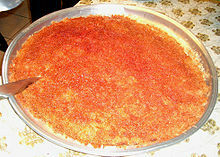 Kanafeh, a well-known dessert in the Arab World and Turkey. Made of several fine shreds of pastry noodles with honey-sweetened cheese in the center, the top layer of the pastry is usually dyed orange with food coloring and sprinkled with crushed pistachios. Nablus, to the present day is famed for its kanafeh, partly due to its use of a white-brined cheese called Nabulsi after the city. Boiled sugar is used as a syrup for kanafeh. Restaurants or mata'im offer a brilliant array of cold appetizers known as the mezze. Notably, hummus bi tahini, mukhluta, sometimes nearly a dozen variations of eggplant salad, tabbouleh, fattoush, chili pepper and red cabbage salads and dishes made up by the chef are served. Kibbee balls and sfiha are the primary hot appetizers available. Heavy meals are rarely provided by restaurants, instead however, the entrées include shish kebab, shish taouk, rack of lamb and chicken breasts. Falafel shops or Mahal falafel offer mainly falafel and shawarma with several different contents. They also offer hummus or tabbouleh to be served with the meal. 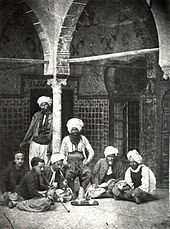 Coffeehouses (called al-maqhah in Arabic) serve hot beverages and soft drinks and are sometimes restricted to male customers—who take part in leisurely activities like playing cards or backgammon and smoking argileh (Arabic for hookah). Sweet shops or mahal al hilaweyat, can be found in the souks of cities and major towns, they offer a wide range of sweets common with Palestinians, such as, kanafeh, baklawa and anise-flavored cookies. Family-run shops often serve at least one type of sweet that they themselves created. The city of Nablus in particular are world famous for their exquisite Arabic sweets, and have some of the oldest sweet shops in Palestine. Soft drinks are also common in Palestinian homes and the city of Ramallah contains a Coca-Cola and Faygo bottling plant, while Gaza, Hebron and Nablus have distribution centers. A Pepsi-Cola plant in Gaza was shut down in 2007. Homemade fruit juices are also a common household drink during warm days and during Ramadan, the holy month for fasting by Muslims. In the Palestinian culture, coffee and tea is traditionally served to adults during a visit or gathering, while juice is served to everyone. Drinks such as tamar hind or qamar deen are served during special occasions to everyone. Tamar hind, originally from Africa is a sweet and sour pulp of tamarind fruit concentrated with water and certain amount of sugar to make the traditional sharbat syrup drink. [22 liquorice drink made by soaking or infusing liquorice sticks, and adding lemon juice. Qamar deen is traditionally served to break the Ramadan fast (as is water), and is an iced drink made from a dry sheet of apricots soaked in water, and mixed with lemon juice or syrup. Two hot beverages that Palestinians consume is coffee—served in the morning and throughout the day—and tea which is often sipped in the evening. Tea is usually flavored with na'ana (mint) or maramiyyeh (sage). The coffee of choice is usually Turkish or Arabic coffee. Arabic coffee is similar to Turkish coffee, but the former is spiced with cardamom and is usually unsweetened. Among Bedouins and most other Arabs throughout the region of Palestine, bitter coffee, known as qahwah sadah (Lit. plain coffee), was a symbol of hospitality. Pouring the drink was ceremonial; it would involve the host or his eldest son moving clockwise among guests—who were judged by age and status—pouring coffee into tiny cups from a brass pot. It was considered "polite" for guests to accept only three cups of coffee and then end their last cup by saying daymen, meaning "always", but intending to mean "may you always have the means to serve coffee". A widely consumed liquor among Palestinian Christians, non-religious Palestinians and many non-observant Muslims is Arak. Arak is a clear anise-flavored alcoholic drink that is mixed with water to soften it and give it a creamy white color. It is consumed during special occasions such as holidays, weddings, and gatherings or with the mezze. Beer is also a consumed drink and the Palestinian town of Taybeh in the central West Bank contains one of the few breweries in Palestine. In addition to regular beer, the brewery produces non-alcoholic beer for observant Muslims. The nearby town of Birzeit is also home to Shepherds Brewery. There is a sharp difference of Palestinian courses eaten on a daily basis in comparison to those reserved for holidays—which include family and religious occasions for both Muslims and Christians. In the past, during the fasting month of Ramadan, the Musaher of a town would yell and beat his drum to wake up the town's residents for suhoor (lit. 'of dawn')—usually very early in the morning, ranging from 4-6 am. The meals eaten during this time are light and foods include labaneh, cheese, bread and fried or boiled eggs along with various liquids to drink. The muezzin's call to dawn prayers signaled the beginning of sawm or fasting. Breaking the day's fasting traditionally begins with the brief consumption of dates and a chilled beverage. Palestinians make a variety of fruit-based beverages, including the flavors, tamar Hindi or tamarind, sous or licorice, kharroub or carob and Qamar Eddine. Tamar Hindi is made by soaking tamarinds in water for many hours, then straining, sweetening and mixing it with rose water and lemon juice. Kharroub is made similarly except instead of tamarind, carob is used. Qamar Eddine is made of dried apricots boiled into a liquid and chilled. The term iftar has a different meaning in Ramadan where it is used to describe the 'breaking of fasting' unlike its common meaning of breakfast in the morning. Iftar begins with soup, either made from lentils, vegetables or freekeh. Shurbat freekeh ("freekeh soup") is made from cracked, green wheat cooked in chicken broth. There is a wide variety of meals served during iftar, ranging from small plates or bowls vegetable-based courses or saniyyehs (large plates or trays) of a particular meat. Common small dishes on the dinner table are bamia—a name for okra in tomato paste, mloukhiyeh—a corchorus stew—or maqali, an array of fried tomatoes, aubergines, potatoes, peppers and zucchini. Pilaf or plain freekeh are normally served alongside the dinner meat. Each household prepares extra food to provide for their neighbors and the less fortunate—who must receive an equal version of the food eaten at home. Ka'ak bi 'awja is a semolina shortbread pastry filled with ground dates called 'ajwa or walnuts. The dessert is a traditional meal for Christians during Easter, however, ka'ak bi awja is also prepared towards the end of Ramadan, to be eaten during Eid al-Fitr—a Muslim festival immediately following Ramadan, as well as during Eid al-Adha. During Mawlid—the holiday honoring the birth of the Islamic prophet Muhammad—Zalabieh which consists of small, crunchy deep fried dough balls in dipped in syrup, is served. The dough is made from flour, yeast and water. A special pudding called meghli is prepared for a new born child, to celebrate new life. The dessert is made of ground rice, sugar and a mixture of spices, garnished with almonds, pine nuts and walnuts. Meghli is commonly made by Christian Palestinians during Christmas to celebtate the birth of the baby Jesus. An infant's new tooth is celebrated with bowls of sweetened wheat or barley and sweets served after a child's circumcision include baklava and Burma. Christian families in mourning serve a sweet bun known as rahmeh. It is a food eaten in remembrance of the dead and as a gesture of blessing the soul of the deceased person. The Greek Orthodox Church offer a special tray with cooked wheat covered with sugar and candy after a memorial service. ^ ABC of Arabic Cuisine Archived 2011-07-04 at the Wayback Machine ArabNet. Accessed on 2007-12-25. ^ Sample Area Background: Beit Ummar Archived 2007-12-12 at the Wayback Machine Christian Peacemaker Teams. Accessed on 2007-07-22. ^ Hummus, a Palestinian staple Archived 2008-12-01 at the Wayback Machine Lalie Ibrahim. Institute for Middle East Understanding, 2006-03-31. ^ One for the record books Archived 2007-10-22 at the Wayback Machine Institute for Middle East Understanding. 2006-06-14. Accessed on 2007-12-19. 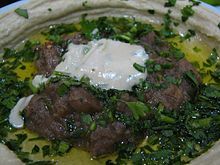 ^ a b c d e f The Palestinian kitchen: Foods of Ramadan Archived 2007-10-10 at the Wayback Machine Mustafa, Sufian. Institute for Middle East Understanding, (Extracted from This Week in Palestine). 2007-09-22. Accessed on 2007-12-23. Wikimedia Commons has media related to Cuisine of Palestine. This page was last edited on 2 April 2019, at 11:54 (UTC).